There are number of times when you really want to share your happiness and sorrow with someone so you feel little relaxed. But at times doing so can actually make you feel worse rather than being relaxed. There are some people or more specifically some friends with whom you should never discuss any of your relationship difficulties and love life. These people will make your life even more difficult than solving your problems so avoid such people to get better advice and support from true friends. A single friend wants to get importance from you and it is really a good gesture if you hear your single friend but such people can be bad advisers. This is because they have their own way of thinking, being single make them to look everything with other perspective where revenge and hatred become dominant factor usually. So avoid single friends who give answers to your problems in term of revenge or fighting back. Friend who is married is another person with whom you should avoid because such friends will not be able to understand the intensity of problem until it becomes really worse that you finish up regretting. We have used the phrase “pleasing friend” to describe such friends who will not tell you the truth rather they will always advise or suggest you something which you want to hear rather than telling the truth. Such friends are never your true friends because they don’t guide you honestly rather please you with fake statements so that you actually commit mistakes and then regret on them later on. Sometimes your friend is just concerned about your power or financial status that he won’t dare to differ from your viewpoint. You should be aware of such friends in your group who always try to say things to please you because advises from such people is of no use for you. Some friends are just concerned about their financial status and power and rarely care about their friends feeling. 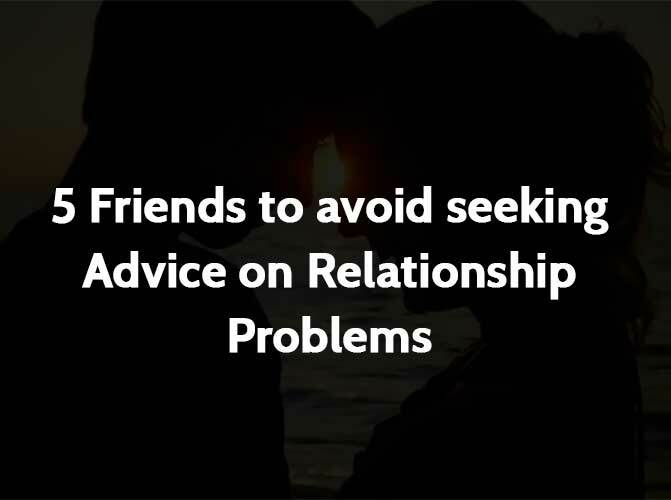 Such people are worse to ask for advice because they would never take interest in your matter with true heart rather will just do it as a formality so that you don’t feel bad. But in reality by doing so your friend is harming you even more because advice from such materialistic friend can make you regret later on. One last type of friend that you should avoid is the one who always blame you for everything and tell you that she already told you this will happen. Try keeping yourself safe from such a friend who is always blaming you.